Louisiana covers 51,843 square miles and has a population of 4,468,976 people. 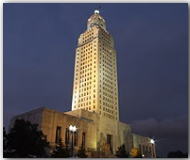 Louisiana’s capital is Baton Rouge, which has a population of 227,818. Other important cities are Alexandria (pop. 46,342), Bossier City (pop. 56,461), Kenner(pop. 70,517), Lafayette (pop. 110,257), Lake Charles (pop. 71,757), Metairie (pop. 146,136), Monroe (pop. 53,107), New Orleans (pop. 484,674) and Shreveport(pop. 200,145). Louisiana was admitted to the Union on April 30th, 1812 as the 18th state. It’s bordered by Arkansas to the north, Mississippi to the east, Texas to the west and the Atlantic Ocean to the south. The state flower is the “Magnolia” and it’s nickname is “Pelican State”. Louisiana’s economy is broken into two categories; agriculture and industry. Seafood, cotton, soybeans, cattle, sugarcane, poultry and eggs, dairy products and rice provide for the agricultural side. While chemical products, petroleum and coal products, food processing, transportation equipment, paper products and tourism provide for the industrial side.